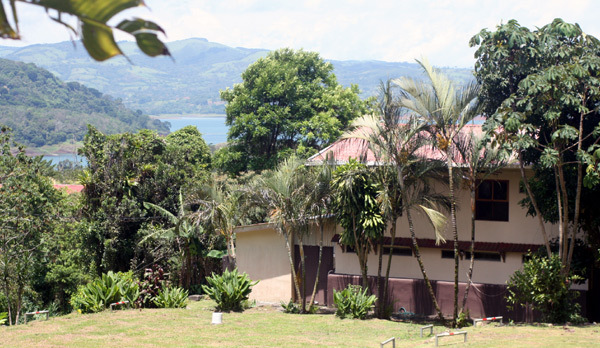 Lake Arenal needs a hostel. There is no backpacker haven. This could be it. 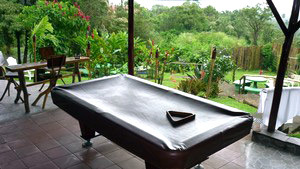 An owner who can cater to youthful high spirits and an international clientele could make of this uniquely situated funky hotel on 2.6 acres a backpacker destination of renown. The 10 rooms (each with a bathroom) are small but the generous common areas inside and out promote kickback ease and socialization. 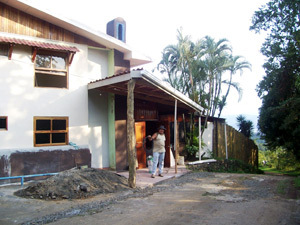 Of course, it can be a regular hotel, but at Lake Arenal there's a niche begging to be filled, and this place could do it. 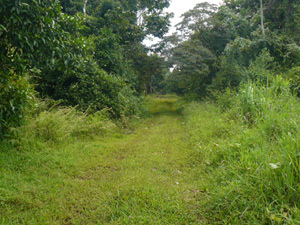 It's on the public bus route between Tilaran, Nuevo Arenal and La Fortuna, just a few minutes north of the town of Nuevo Arenal. 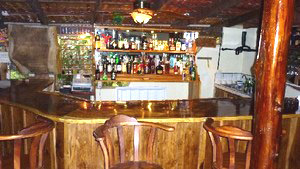 While it has its own large kitchen, bar and indoor/outdoor dining, nearby are a German restaurant and an informal lakeview steak house. 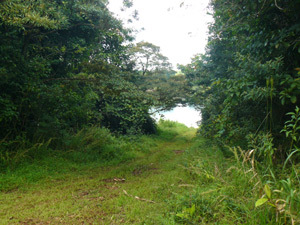 Best of all, there's a beautiful rural lane that in a 10-minute walk through countryside full of birds and other wildlife brings guests to protected warm-water cove on Lake Arenal for swimming, fishing, kayaking, and other water sports that can be arranged from this hotel. Publicize this enjoyable waypoint on international hostel websites, point them downhill to the secret cove, and realize a thriving business while enjoying spirited, intelligent guests and beautiful surroundings yourself. A construction project goes on near the hotel entrance where passes the country lane leading down to a secret cove. 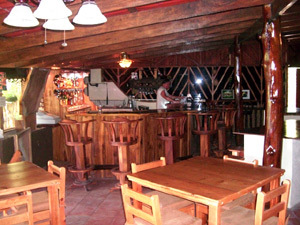 The invitingly rustic bar and restaurant contain custom-made hardwood furniture including unique bar stools. 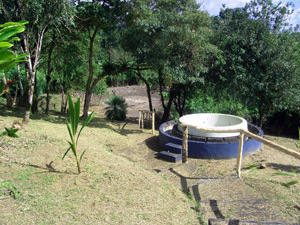 At this time of this photo the large jacuzzi and the pond beyond it were without water but promising good times ahead. 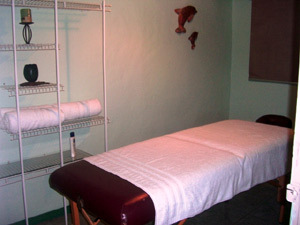 One of the rooms is set up for massage, just one idea among many that could make this hotel a great hosteling experience. 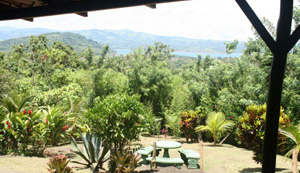 There are plenty of spaces indoor and outdoor to enjoy socializing, playing games, watching the fabulous birdlife and occasional troupe of howler monkeys, and reveling in the temperate semi-tropical weather and wonderful vista. 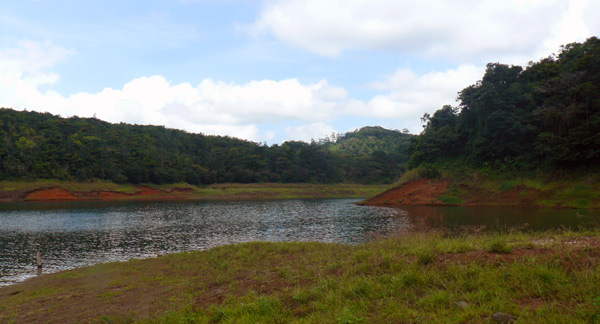 The walk - or drive by car or 4-wheeler - down to the cove provides fine views of beautiful Lake arenal while passing through ranch and forest. At some points the trees almost complete an arch over the lane. The lane makes a sharp right and the cove comes into view. 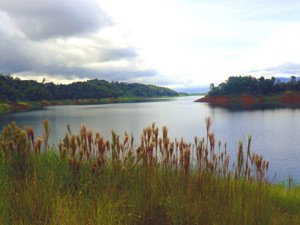 The protected cove, surrounded by forest, has at the end of the lane a broad nearly level area providing plenty of room for picknicking, games, equipment such as kayaks, and parking. It's little known and rarely visited now but could be a great recreational draw. From the cove a wide channel leads out to the nearly 20-mile-long lake. 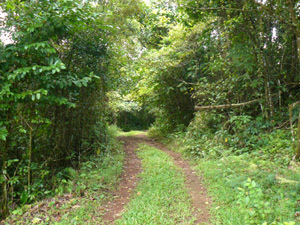 Starting back to the hotel from the cove, the gently sloped lane provides an easy hike. 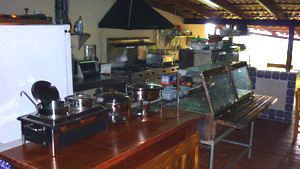 The kitchen is large and well-equipped. 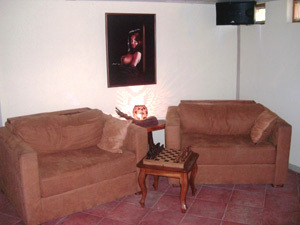 The bar has custom-made swivel bar stools. After kayaking, how about chess? 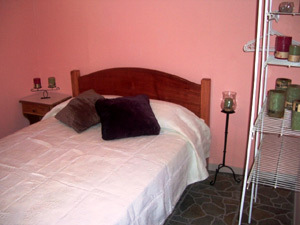 Guests enjoy private rooms after active days.